I have no info about this one graciously send by Alexander and it was certainly a good surpise. 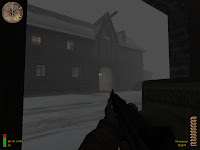 You aim is to run through a snow village on a fogy afternoon in order to find the SS commander and kill him. Design is well put together with some great touch in layout and architecture, we can complain a little about those textured vegetation walls that are directing our travel but this is for me a minor issue regarding to the general layout of this map. 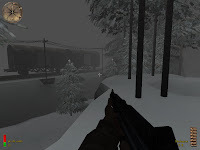 At first you will discover a well detailed farm with good architecture and interesting texture attention (even if some room didn't get some element of detail), the road is also well made in a not flat layout, after the forest is a little bit more appoximative, but the train bridge and the two rail wagons add something really important in a map: the depth.